This comfortable, three-bedroom, two-and-one-half bath townhouse is situated on the beautiful Rollingstone Ranch (formally Sheraton) Golf Course, providing a truly peaceful and beautiful setting. The deck offers incredible views of the Flat Top Mountains and Yampa Valley. In the morning, brightly colored hot-air balloons can be seen launching in the distance. In the winter, the golf course becomes a groomed cross-country ski touring center. You can also watch for fox in the morning and evening as they go door to door for handouts from the neighbors! This tastefully furnished townhouse is located one mile from the base of Steamboat Mountain and is just minutes from the hustle and bustle of downtown. There is a spacious, two-car garage. The main level has a full kitchen, dining area, half bath, and living room with a sleeper sofa. There is an enclosed private hot tub room through the sliding glass doors off the living room. The entertainment center offers cable TV, VCR, DVD player, and stereo. Upstairs, there are three bedrooms: the roomy master which contains a king-size bed, cable TV, and private deck; a large second bedroom with a queen-size bed as well and a darling third bedroom with a set of twin beds that display carved mountains on the head boards. The bathrooms offer granite countertops with ceramic and slate tile. Our lovingly cared for townhouse has been a constant source of enjoyment for us. 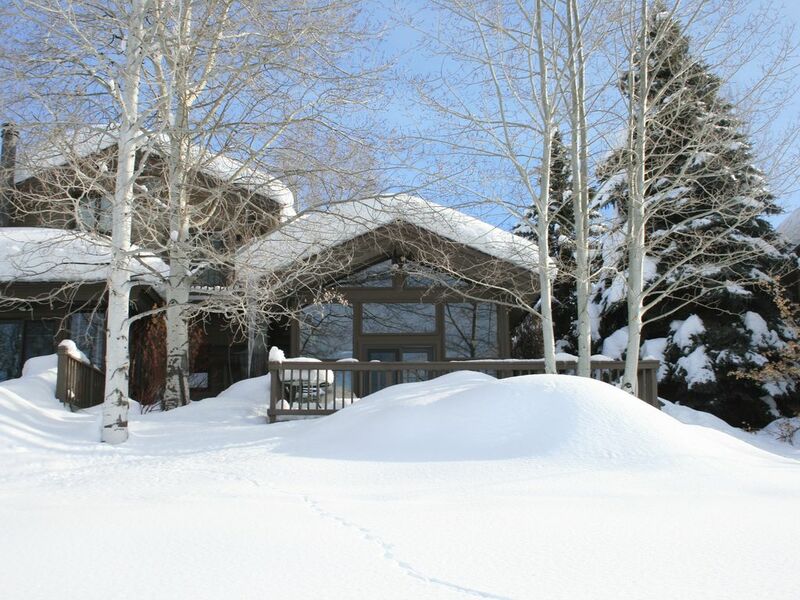 Steamboat has it all for whatever you are looking for in a vacation! Besides the best champagne powder in all of Colorado for downhill skiing, there is no place more unique than the outdoor hot springs at Strawberry Park. There are miles of open trails to hike, snowshoe, or cross-country ski. Snowmobiles and dog sleds are available if you prefer to sit back and relax to enjoy the beauty of the outdoors. And, you will not be disappointed by the shopping and fabulous restaurants which offer a variety of delectable dining experiences. We love our Steamboat home! It has been a source of so much enjoyment since we have been here! This is a perfect location. Close to the ski resort and on the beautiful Rolling Stone Golf Course. The golf course is also the nordic ski resort in the Winter. We love it. Very peaceful and comfortable. Our home is in a quiet setting directly on the Rolling Stone Ranch Golf Course and is 1 mile from the gondola. The home has a full kitchen and a private hot tub inside the unit. We leave spices although we cannot guarantee what will be there for sure as well as paper products such as paper towels, napkins and trash bags. Plenty of plates, glasses and eating utensils. Full size kitchen with new refridgerator, dishwasher and microwave purchased in 2014. Private hot tub for out unit only. Loved the place great fit for 4 adults and 3 kids. Hot tub could have been a little bigger but was so nice to come back and soak after skiing. Plenty of kitchen things and towels. Garage was great to store all ski stuff in. Hope to come back in Summer. Great location to ski hill and to downtown shops. My family thoroughly enjoyed our week long stay in this beautiful condo. The 3 upstairs bedrooms provided everyone with their own space and quiet for those who slept later. We took full advantage of the washer and dryer, well stocked kitchen and hot tub. We played many games in the comfortable living room in front of the delightful fireplace. Ann was very responsive when we had questions. I highly recommend this condo! Great cabin 5 min from lifts!! We really enjoyed the cabin! Warm, easy to get to, convent to the mountain and shopping! Really enjoyed the hot tub after a long day on the slopes, snow shoeing, or fly fishing. Thanks y’all!! This town-home is a real keeper. We stayed in late September and early October but the town-home would be really good any time of year. It is well equipped, has a super deck with great views to the west, is adjacent to a golf course, and has all the amenities you'd want. The three upstairs bedrooms make it easy to get some privacy. The garage is a bonus which would be especially valuable in the winter. The Dixon Home was so comfortable and perfect for our group. The house is comfortably furnished and very clean. We especially loved the deck. We had a perfect weekend. This condo was such a great place to stay! Clean, organized, had everything we needed. We went for a soccer tournament and had a great place to relax after the games, we’ll definitely put this on our list for other adventures in Steamboat.